We ran in the Seton Soles 5K Run/Walk on Saturday. 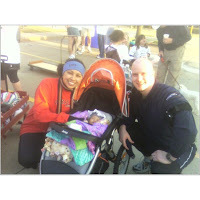 This was Mari's first 5K and it wasn't too bad. I got up at 4:30 for her first morning feeding and opted to not go back to sleep since we had to be at the race at 6:30. Even though I didn't get to bed until 1:30 (yeah, I was exhausted! ), I knew it was going to be a great run. By the time she finished eating and I changed her, it was after 5 and I knew if I went to back to bed, I'd be really cranky and sleepy. Instead I got dressed and figured I'd go for a coffee run. Who know Starbucks didn't open until 6 on the weekends?? Bleh! That didn't make me happy. It was really chilly outside too. When I got home, I added a couple of other layers and planned to add a few more layers to Mari. By this time, Will was up and was ready. I logged in online to verify where we needed to park and then we headed to Starbucks. Cafe Mocha for Don, Cinnamon Dolce Latte for me...nonfat milk, no whip, at 140 degrees. Good stuff! Now that I had my go-juice, I went back home and loaded up the car and baby. We headed to the race. I had those pre-race jitters. My strategy wasn't so much to run it, but to finish it in a decent time. I figured I'd jog for a bit, walk for a bit, alternating like that until we finished. The race started and off we went. I turned on the ipod and coming out of the speakers of the jogging stroller was my calm and relaxing mix. Since I was towards the back when the race began, I had to maneuver through several people until I got to a comfortable level. By the time the race started, it was significantly warmer and I was feeling more awake. The first mile was right at 11 minutes. Not too shabby considering the first half mile was start-stop mess. The second mile was at 10 minutes. I admit I had to stop and walk for a little bit. I was getting paranoid that I was going to wet my pants. I was certain this was going to happen. I'd been having some accidents in recent weeks when I'd been working out or running. I was terribly afraid this was going to happen, so I kept stopping at the on-set of any pressure. That last mile I was determined to get it under 9 minutes, so I kicked it in gear. There was a bit of a hill to conquer and I was on an 8.5 minute mile pace when my little one gently reminded me that I was a mommy. Thank God I brought the bottle. I pulled off to the side and we sat on the curb for her feeding. She was much happier and better, but was not going to let me put her back in the stroller. So I held her and we walked. Don and Will had finished the race and came walking back to catch up with me. Will took over the stroller and Don held Mari for a bit. He offered to let me run to finish strong, but I figured I'd just walk it out to the end. He handed her back to me and we crossed the line at 48 minutes. I didn't think that was too bad especially since I sat for nearly 10 minutes feeding her! We survived the first 5K! Wahoo! Afterwards, we treated ourselves to the Original Pancake House. Gotta love those fresh banana pancakes! When I got home, I immediately took a warm shower and crashed out for a couple of hours. Don and Will went to trim trees. When they made it home, we headed to Arbor Hills so they could do some biking. I leisurely walked with Mari to stretch my legs while they rode. My hip joint was pretty tight and I realized that I was getting older! ha ha! Then, we were bad again and had Mooyah for lunch. I absolutely love these burgers and I'm adding them to my faves list! That night, my sister came over to watch Mari so we could have a date. Originally we were going to go to a movie, but it was sold out. Instead, we headed for oysters, but before that we went to Mi Cocina for drinks. Another late night for me, but well worth it!